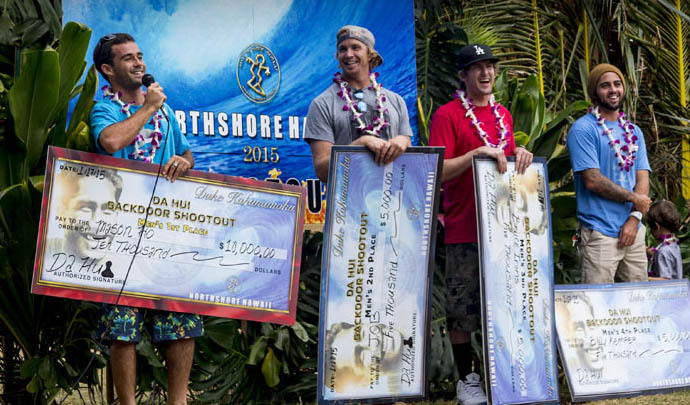 1/19/15: Hawaiian Mason Ho wins the 2015 Da Hui Backdoor Shootout in Memory of Duke Kahanamoku. The contest used a team format with each team of 4 surfers getting to surf three 30 minute heats at perfect Pipe. Mason was on team Da Hui Surfwax with Kamalei Alexander, Dean Morrison and Kiron Jabour. The first two rounds of the contest were held during the best Pipe/Backdoor swell of the season with Mason’s scoreline being 10, 9.53, 9.23, 8.5 and 7.33 to win vs a field of competitors that include Bruce Irons and Jamie O’brien. His Dad won the original Duke Kahanamoku Invitational in 1978 and 1981. His uncle Derek won in 1984. Now Mason carries on the legacy of North Shore contest wins. Huge congrats Mason! Check out all the “Mass Mason Media” below. Check out Mason’s Pipe bomb at the 1:25 mark.